[1822, Part I., pp. 209-211.] Lincoln, a place of considerable note in the ecclesiastical and military annals of England, is singularly situated on the top and side of a high hill, which slopes with a deep descent to the south, where the river Witham runs at its base. A large part of the city, or rather suburbs, extends in a long street from the foot of a hill to the south. On the northern side of it, without the walls, is another suburb, called Newport, supposed to have been an outwork of the Roman station. ... As a military station, occupied by a colony of Romans, it must have been a place of some extent and consequence. This is manifested by the vestiges that remain, and by the various discoveries that have been made at different periods. The form of the fortified station was that of a parallelogram, divided into four equal parts, by two streets, which crossed it at right angles. At the extremities of these were four fortified gates, nearly facing the cardinal points. The whole was encompassed by an embattled wall, which on three sides was flanked by a deep ditch, but on the southern side the steepness of the hill rendered a foss unnecessary. The area thus enclosed was about 1,300 feet in length, by 1,200 feet in breadth, and is estimated to have contained thirty-eight acres. The walls have been levelled to the ground, and the gates, except that to the north, have been for many years demolished. 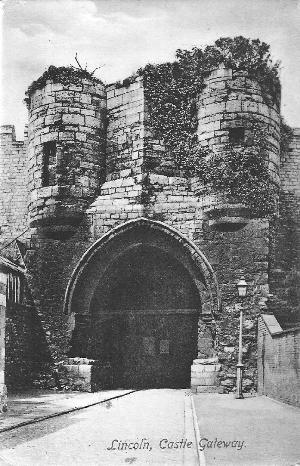 The latter, called Newport Gate, is described by Dr. Stukeley as " the noblest remnant of this sort in Britain, as far as I know." . . .
Of the castle built by the Conqueror, little now remains; and the area is occupied by buildings appropriated to uses of the municipal power. The few remaining vestiges convey the same idea of original Norman architecture as that of York, erected nearly at the same period. The keep was not included, but stood half without and half within the castle wall, which ascended up the slopes of the hill, and joined the great tower. This being situated on a high artificial mount, it was equally inaccessible from within and without the castle area. It was nearly round, covering the summit of the mount; and was thus rendered a distinct stronghold, tenable with or without the castle. This accounts for the circumstance mentioned by Lord Lyttelton, of the Earl of Chester making his escape, while the castle was invested by Stephen. From the keep to another tower, placed also on an artificial mount, was a covered way by which a private communication was kept up. The walls are above seven feet thick ; and under the place of ascent from the covered way, there is something like the remains of a well, protected by the massy thickness of the walls. The outer walls of the castle enclose a very large area, the entrance to which was by a gateway, between two small round towers, still standing, under a large square tower, which contained magnificent rooms. In one corner of the area is a curious small building, appearing on the outside like a tower, called Cobshall. ... On the northwestern side are the remains of a turret, having the curious arch mentioned by Sir Henry Englefield, which, being in the line of the Roman wall, might have belonged to a more ancient building, or been a gateway to the old city. Within the area of the castle are the county gaol and shire hall, both modern structures, and well adapted to their respective purposes. . . . The cathedral, or, as it is usually called, the minster, is justly the pride and glory of Lincoln. This magnificent building, from its situation on the highest part of a hill, and the flat state of the country to the south-east and south-west, may be seen at the distance of twenty miles. . . . The first foundations were laid in the year 1086, by Bishop Remigius, and the building was continued by him and his successor, Robert Bloet. Soon after the death of this bishop, the church is said to have been burnt down about A.D. 1127, and rebuilt by Bishop Alexander, his successor, with an arched stone roof, to prevent the recurrence of a like accident in future. . . . But though thus rendered pre-eminent for size and decoration, it was made more , elegant, etc., by St. Hugh of Burgundy, in the time of Henry II. This prelate added several parts, which were then named the " New Works." The cathedral consists of a nave, with its aisles, a transept at the west end, and two other transepts, one near the centre, and the other two near the eastern end; also a choir and chancel with their aisles of corresponding height and width with the nave and aisles. The great transept has an aisle towards the east; attached to the western side of this transept is a galilee or grand porch; and on the southern side of the eastern aisle are two oratories, or private chapels, whilst the north side has one of nearly similar shape and character. Branching from the northern side are the cloisters, which communicate with the chapter-house. The church is ornamented with three towers: one at the centre, and two other at the western end. These are lofty, and are decorated with varied tracery, pillars, pilasters, windows, etc. ...	N.